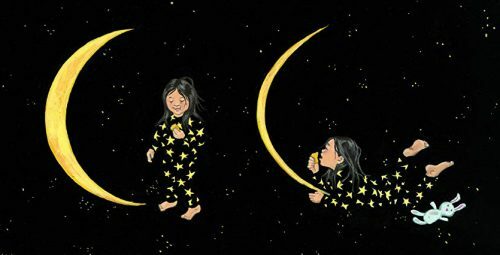 Grace Lin’s lustrous A Big Mooncake for Little Star compellingly recalls the 1940 Caldecott Medal winning Many Moons by James Thurber and Louis Slobodkin and a far more recent picture book by Ida Perle, The Moon Is Going to Addy’s House. Though each of the three books in this equation yield fantastical propensities and designate a central role to our oft-referenced celestial neighbor, so prominently featured in song, poetry and art (Van Gogh’s The Starry Night, perhaps most famously of all) they are markedly different. Addy’s especially incandescent moon pops up anywhere and everywhere, and even comes close to being held, a desire Princess Lenore demanded of her father in Slobodkin’s classic. 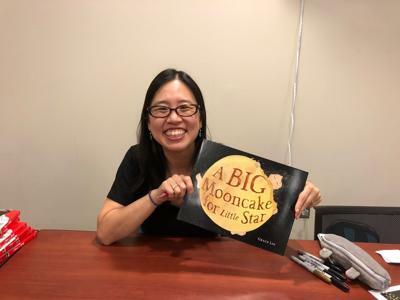 The moon in Lin’s book is symbolic in a culinary sense, but one that craftily documents the changes phases for children who might benefit with an appealing fantastical explanation before being eased into the astronomical truth. For adult readers it is an utter delight and a sly wallowing in a fantastical premise. A Big Mooncake for Little Star is a story that that is said to reflect Chinese stories about the moon. In an interview the author explained one story that inspired her book – that of the rabbit that lives on the moon. According to Chinese legend, if you tell the rabbit a wish, he will whisper it to the moon goddess who may grant it. The book’s sleek black base is what will invariably attract the attention of readers young and old. The choice has a three-fold allure: first, it accentuates any other color, especially yellow for incomparable contrast, secondly it exhibits a natural kinship with imaginary outer space narrative, and lastly it emboldens a sense of immediacy, giving the book an otherworldly visual scheme, transporting the viewer from the domestic surroundings where the events are played out to a limbo, where reality shares a claim with the surreal for center stage. Lin explains on the copyright page that “the illustrations for this book were done in Turner Design Gouache on Arches rag watercolor paper, and her application of luminous white typography is perhaps the most attractive in that department of any picture book released this past year. With mother and daughter dressed in starry pajamas near a stove, the former equipped with oven mitts pulled out the flat Mooncake of the title. The mother, concerned the baking will be undone by her daughter’s overindulgence tells her: Now, Little Star, your Mooncake took us a long time to bake, so let’s see if you can make it last awhile. Can you remember not to touch this Big Mooncake until I tell you to? The child answers “Yes Mama!” but veteran readers might be thinking about the little chicken in David Ezra Stein’s Caldecott Honor winning Interrupting Chicken, which documented a litany of false promises. Still, with their garb fully attuned to each other one might be loathe to thing is such terms. In moon-shaped and colored vignettes Little Star retired to her teeth brushing, face washing and bed-snuggling, the latter with a book and and stuffed bunny before losing consciousness in horizontal mode, but as most readers would have a hard time not expecting she wakes up in the middle of the night. 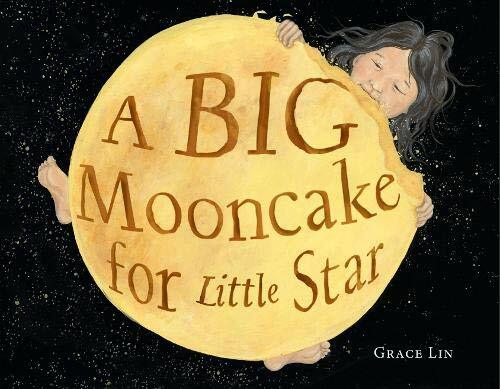 Unbeknownst to some of the youngest readers Lin moves in Fantasy Land when Little Star loses memory of her mother’s edict and thinks solely of the enticing Mooncake, which is seen nearly as big as one full page in all its moon-like glory. With a soft nighttime pat pat pat this nocturnal adventurer tiptoes over to the Big Mooncake and biefly pauses to ask herself if her mom would really mind too much “if she took a tiny nibble?” Little Star balks at that possibility and secures that nibble: Mmmmm, yum! With mooncake particles on her face and streaming from it, Little Star loses her nerve, thinking someone might be coming and flies back to bed in a buoyant tapestry that might for some recall the Caldecott Honor winner, In the Night Kitchen by Maurice Sendak. The next evening Little Star is again tempted, remembering how delicious her first taste of this culinary delight has been. Her quandary is again shown in minimalist terms as she awakens in a jet black swath of nothingness, where only some yellow moon dust/mooncake crumbs punctuate the expanse. Little Star with her bunny companion finds out in short order that la luna is still there and in an almost perfect circle. Sharp eyes onlookers of course will note in the right bottom a tiny sliver is shaved off as a result of this girl-on-a-mission’s previous indiscretion. After a second serving Little Star followed by a stream of yellow particles flies back to bed, only to return for a third session in what is clearly a statement about the difficulty to resist once initial success is negotiated. A fourth helping of the seemingly inexhaustible Mooncake Nibble, nibble…yum! is a clear enough statement on Little Star’s nighttime habit and the double spread of her fully immersed, watched only by her bunny is an utter delight, and one of Lin’s most magnificent. But even that double spread is an appetizer to A Big Mooncake for Little Star’s main course, which surely takes it’s place among the most spectacular of the year. In a dozen late night excursions the one-minded child in magician’s garb rivals Augustus Gloop from Roald Dahl’s Charlie and the Chocolate Factory, though Little Star who took “tiny nibble after tiny nibble of the Big Mooncake” awards her fledgling audience a real if subversive explanation of how and why the moon is beheld in different appearance. While some may find some irrefutable scientific evidence in their classes and outside study that the moon’s disparate stages have something to do with astronomical matters, some may never forget that Little Star played a role in the seemingly drastic changes. Little Star’s mother eventually learns the truth or does she? She found the Mooncake was persona non gratta , and in its place just a trail of twinkling crumbs and bunny aside of them. Moving back to reality mama shakes her head and asserts knowingly “You ate the Big Mooncake again, didn’t you?” Little Star with a smiling verisimilitude admits the deed, but holding her mother’s hand urges her on to make another on. Lin’s book is a study in craftsmanship. The arches paper is study and flexible, the stunning end papers which both picture mom and child busy preparing the batter and final product for the oven are framed with kitchen shelving and various products, books, cooking spoons and a clock in a scene by well-ordered and messy at the same time. The inside cover, replicating the book’s grandest spread is a showcase for the phases of the moon, navigated by cake-loving adherent who has produced an answer more appealing and just as effective and those with a command of astronomy. The dust jacket is wholly magnificent, featuring the proportionately colossal “Mooncake” with title in lower case (except for “BIG”) and the incessant nibbler in full grasp from behind. You’d almost expect a voice exclaiming “Nibble, nibble nubble, who gnaws my Mooncake to rubble” but we are not quite in the realm of the Brothers Grimm. The equally splendid back urges readers to watch the phases of the moon transform, again featuring Little Star taking a bite of her favorite desert. Whereas the poet Alfred Noyes once wrote “the moon is a ghostly galleon tossed upon cloudy seas” its role in the symbolic A Big Mooncake for Little Star is a celebration of our planet’s closest neighbor, a yellow sphere that for those just learning might be dumbfounded by it’s altered appearance, one night a perfect circle, another one-half of a lemon pie, yet another more like a curled banana. Beguiling, exquisite and rapturous, Lin’s unique offering is one of the year’s most grandiloquent for art lovers and a splendorous wedding of word with image. If the Caldecott committee connects with this masterpiece you might hear a few members humming that beloved do wop Number 1 classic by the Elegants from 1958 emerging from their meeting: Where are you little star? Where are you? Whoa oh, oh, oh uh oh / Ratta ta ta, too, ooh ooh / Whoa oh, oh, oh uh oh / Ratta ta too, ooh ooh. Note: This is the twenty-second entry in the 2018 Caldecott Medal Contender series. The annual venture does not purport to predict what the committee will choose, rather it attempts to gauge what the writer feels should be in the running. In most instances the books that are featured in the series have been touted as contenders in various online round-ups, but for the ones that are not, the inclusions are a humble plea to the committee for consideration. It is anticipated the series will include in the neighborhood of around 25 titles; the order which they are being presented in is arbitrary, as every book in this series is a contender. Some of my top favorites of the lot will be done near the end. The awards will be announced in late January, hence the reviews will continue until around the middle of that month. Sam — I’m going to add this book to my granddaughter, LUNA’s, moon-book collection. It seems like a perfect fit! A titanic review Sam. Your love for this book shines through like the bright light off the moon. Love so many of the references and descriptions and that buffo Elegants song you wittily conclude with. I’m thinking this will be one of the winners? We love this book over here in China, it, and all of Grace Lin’s books, are big favorites with our predominantly ‘American Born Chinese’ students. Not long to go now and we will know for sure…The suspense is (not) killing me…it is still one of the most exciting times of the year. Sam, you had me going with that Elegants song. Talk about enthusiasm, yours has gone through the roof and has inspired one of your very best reviews. I haven’t even yet laid eyes on this book and you have me rooting for it now. And The Highwayman and Dvorak for good measure! Extraordinary piece. The color design is, as you well mention, Sam, a joy to behold. I really like, however, how the down-to-earth narrative cuts away mystery and gets down to simple joys. That cheeky tempering of the celestial is a rich study in itself!